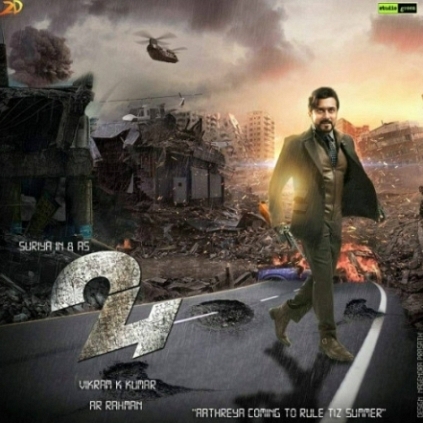 24 was released in the US and Canada by Cine Galaxy Inc, in both Tamil and Telugu. Suriya was also there in the US for the premiere of the movie along with Jyothika. 24 is Suriya’s 3rd home production which opened to good reviews across the globe.The movie’s Tamil and Telugu versions together collected $1,074,844 in North America in its opening weekend according to official confirmations. “Interestingly, 24 joins the likes of Theri, Nannaku Prematho, and Manam which had ranked in great numbers earlier.” quoted Cine Galaxy, the distributors of 24 in North America. 24 is also stated to be the highest grossing Suriya starrer ever in the North American market. This is also director Vikram.K.Kumar’s 3rd film to join the million dollar club in North America. Rahman completes two songs for Rajeev Menon? 24’s Distributor Gnanavel Raja Goes An Indefinite Hunger Against Piracy. Suriya Is Not The Real Hero Of 24! People looking for online information on 24, Suriya will find this news story useful.